"Why must there be such inexplicable pain?" This peculiarly stirring film isn't a war movie, exactly—it's kind of a Zen war movie, or a postwar movie. Kon Ichikawa has made a film that is frequently lyrical and spiritual—he seems at times almost to be testing the limits as to what we'll accept in a war movie, or a movie of any kind, really, and withstands the doubts to emerge with a story of transformation and pain and a deeply felt sense of humanity. It's deeply unconventional, and often very affecting. The action begins with a Japanese platoon stationed on the island of Burma in the last days of World War II—defeat at the hands of the Allies is literally hours away, but these men continue to fight the good fight. (It's also worth noting that in this movie about the carnage of war and its brutalizing psychological effects, we hear not a word about Hiroshima or Nagasaki.) PFC Mizushima (Shoji Yasue) soothes the souls of his platoon by playing the harp, one he's fashioned himself and taught himself how to play. At times it's almost like we're on the verge of an old-time MGM musical, for the Japanese soldiers sing like angels in eight-part harmony—they soon learn that the Emperor has surrendered, that Japan has been defeated, though they mark the occasion by finding a British platoon which sings together as tightly as their former enemies. There's unquestionably a slightly absurd quality to this, and it's almost as if Ichikawa is prepared to cede the realities of war to the music—but then Mizushima is called in on a special mission. Word of the armistice hasn't reached another band of Japanese in a nearby cave, and these soldiers have vowed to fight to the death. The English don't want to incur unnecessary additional carnage—they'll wipe out this squadron if they must, but are prepared to give the harpist an opportunity to get them to surrender with dignity and without violence. Alas, those in the cave cannot see beyond their rabid devotion to Hirohito and they take Mizushima for a traitor; they'd rather die than surrender, and they get their way. Amazingly enough Mizushima is the only one not to be killed, and he escapes—this is his epiphany, and he sets out on a spiritual quest in the garb of a monk, one man trying to make sense of the madness that surrounds him. Mizushima's unit has vowed to leave no man behind, and they're ignorant regarding the harpist's new spiritual quest, so they case the countryside for their one fallen soldier—their war will be incomplete without saving Private Mizushima. The film cross-cuts between the two quests—Mizushima's purification is challenged by the heaps of rotting corpses he finds, and he seems to want to take on all the world's pain; his mates fear dishonoring their army, their families, and themselves if they don't restore their unit to its full strength, even in defeat. There's a strange delay to Mizushima's emotional unraveling—he's sanguine under fire, but it's almost as if he's got acute post-traumatic stress disorder, so horrified is he by all the suffering he sees. Ichikawa strains the structure of his movie a little bit—the plot relies on not one but two talking parrots, but we quickly come to understand that the plot here isn't the point. The improbable coincidences bring us to a resolution that's reasonably satisfactory, with the members of Mizushima's unit satisfying themselves that they've done their best and can do no more, and the harpist himself knowing that the only way he can go on is living a spartan existence of meditation and repentance. It really is quite beautiful, and is a film that wins you over to its improbabilities. Image Transfer Review: There are occasional instances of scratches and of bacterial decay, but overall it's a great pleasure to look at this transfer—Ichikawa's use of depth of field is frequently extraordinary, and his images are well rendered here. The occasional matte shot looks deeply jarring, which may well be an indication of just how strong a transfer this is. Audio Transfer Review: The track is generally free of hiss and crackle, though the occasional bits of dialogue from the British soldiers indicate just how limited the dynamics are here. Extras Review: In a 2005 interview (16m:23s) a very gracious Ichikawa discusses the influences on his directorial style, the novel on which the film is based, and working with the cast—he's the furthest thing you can imagine from an autocratic director, and Rentaro Mikuni vouches for that fact in a 2006 interview (11m:46s). Mikuni plays the captain of Mizushima's platoon, and goes over Ichikawa's rigor in adhering to his storyboards, down to each second of film. And in an accompanying essay, Tony Rayns provides an elegant career overview for Ichikawa. A relatively spare extras package, but one emphasizing quality over quantity. 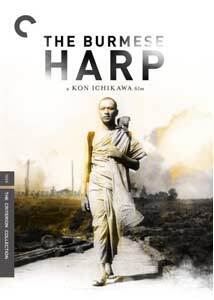 More spiritually bracing than just about any other war movie imaginable, The Burmese Harp blends its seemingly discordant elements into something deeply resonant. Kon Ichikawa's film has more of an affinity with the ethereal pictures of Robert Bresson than with conventional war pictures, and that's a compliment of the highest order. The movie looks wonderful on this DVD, with just enough extras to whet your appetite for more of the director and his work.